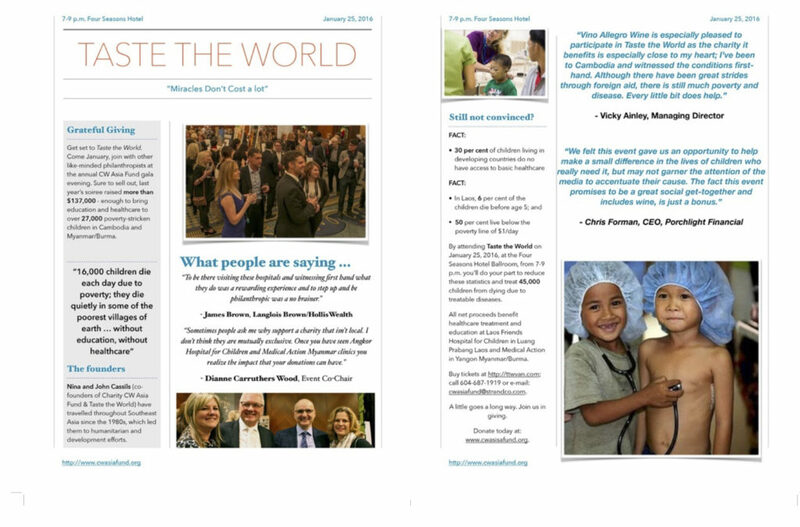 Highlights of our 2016 TTW event media coverage included a two page spread in GRAND Magazine and features in both The Vancouver Sun and the Province newspapers. Chairs Brenda McAllister and Cinnamon Russell helped Taste The World fund more education and medical care in Laos and Myanmar. THERE’S YOUR TROUBLE: Ever worried about innocently raising a mitt at auction sales? Meet Hotel Georgia general manager Philip Meyer. After waving to TV news anchor and eight-month squeeze Sophie Lui at the recent Taste The World gala, Meyer found he’d paid $2,000 to attend a Dixie Chicks concert July 7. Outhouse luck prevailed, though, as the lot included a Rogers Arena suite for 12, and $1,000 worth of food and beverages. Six couples staying at the Georgia that night would pay $3,300. The real winners, gala co-chairs Brenda McAllister and Cinnamon Russell said, should be 45,000 children in Laos and Myanmar whose education and medical care the event will help fund. Lauren Thorpe logged Philip Meyer’s winning $2,000 auction bid after he thought he’d merely waved to girlfriend and TV anchor Sophie Lui. Brenda McAllister, left, and Cinnamon Russell steered the annual Taste the World wine & spirits event, which raised $151,000 for child health care in Southeast Asia. WORLD AID: After vacationing and falling in love with Myanmar and its people, John and Nina Cassils rallied others to visit Southeast Asia and support the area’s need for better health-care education and medical treatment. The couple founded Taste the World, a wine and spirits sampling event that supports the Angkor Children’s Hospital in Siem Reap, Cambodia, as well as medical facilities in more rural areas. Brenda McAllister and Cinnamon Russell chaired the 2016 staging, welcoming 400 guests to the Four Seasons Ballroom for the annual tipple fest and auction, which was sponsored this year by Blue Shore Financial and Aaron Van Pykstra and Mike Wood’s Autoform dealership, which displayed a shiny vintage red Maserati outside the hotel. Event MC Sophie Lui and event partner James Brown, wealth adviser for Langlois Brown, saw first-hand the need to support the Cassils’ humanitarian effort after visiting Myanmar. Both contributed to the record-setting $151,000 raised on the evening. Part of that haul inadvertently came from Lui’s date Philip Myer, the dapper Rosewood Georgia hotelier, who chose an inopportune time to wave to his news-anchor girlfriend during the live auction — and ended up scoring a date with the Dixie Chicks. The evening’s proceedings will help treat some 30,000 children in Southeast Asia this year.